Harrower, father of Steve, and brother of Jimmy who played for Hibernian, Liverpool and Newcastle United, was given his Football League chance by Torquay United, who had signed him in the summer of 1946 from Third Lanark. Whilst serving with the Royal Air Force during the Second World War, he played for the R.A.F. against an F.A. XI. He scored three goals in 16 league appearances for Torquay, prior to signing for Exeter City in July 1948 for a fee of £1,000. The Grecians had to beat off interest shown by Mansfield Town for the players’ signature. 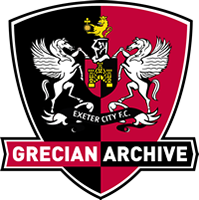 Harrower made his Grecians’ debut in a 3-3 home draw with Aldershot in September 1948 and went on to score six goals in 21 outings in his first season at the club. His best season for Exeter was in 1950-51 when he featured in 32 league matches and scored two goals as the team ended in 14th place in the Third Division South. Released at the end of the 1951-52 campaign, Harrower signed for Bideford in August 1952 who were managed by former City player, Harry Sutherland. In 1962-63 Harrower was playing for Newton Spurs.